Types of rabbits by coat pattern and colors. Here's the list of descriptions. When choosing a rabbit, knowing the types of rabbits available may help you. Some pet rabbits only come in one or two colors, while others come in a large variety. So, not only do you need to decide on the type of rabbit and size of your pet rabbit, but you can also choose the coat pattern on some. Here’s a general explanation of the rabbit breeds on coat patterns and colors that may help you in your search. When reading the list of the types of rabbits coat patterns and colors, please note that some pet rabbits may not fall within these guidelines. I believe my Petie was a mixture of 3 different types of rabbits. I never bought my little guys from a breeder; they were all given to me so I’m not sure whom the parents were. Agouti Pattern – This is the color pattern seen in wild rabbits. The hair-shaft usually has three or more bands of color, with a dark gray base. The head, ears, feet are usually ticked while the eye rings, belly and chin are a lighter color. Agouti-colored rabbits come in chestnut, chocolate, sable, lilac and smoke pearl. Brindle Pattern – This pattern is a mixture of two colors, one dark and the other a lighter color. The mixture of these two colors is throughout the entire coat. Broken Pattern – There are two different Broken Patterns, a bi-color and a tri-color. The bi-color broken pattern is a color in combination with white. A rabbit whose body was brown spots and white would be a bi-color broken pattern. The tri-color is two colors in combination with white. Marked Pattern – These rabbits are usually white with a distinct pattern in one color over their entire body. Pointed White Pattern – This is a white rabbit with a darker color on its nose, ears, feet and tail. Self Pattern – Is a rabbit that is just one solid color. Shaded Pattern – This is a rabbit that has a darker shade of color on its back, ears, head and tail with a gradual lighter shade of that color on the sides. Solid Pattern – Similar to the Self Pattern except a Solid Pattern may include agouti and other mixed-color fur, just as long as it does not create a distinct marking or pattern. Ticked Pattern – This pattern has a consistent base color throughout the rabbit’s coat with an addition of contrasting solid or tipped guard hairs. Wide Band Pattern – This is where a rabbit has the same color on their head, ears, body, tail and feet. Their eye rings, belly, under their chins, and underside of their tails are a lighter color. Here is a list of the different variety of colors. Please note, that the breeds have their own color or colors standard for each breed. Beige – A Beige rabbit has this coloration all over their bodies except on the napes of their necks, which is a lighter shade. Their stomach and eye rings are a bluish white color and they have eyes that are brown with a ruby glow. Blue – This is a medium-shade of gray that has a blue or lavender tint to it. The eyes are a blue-gray color. Castor - A deep, rich, mahogany brown color that is tipped in black. This color is throughout the entire body except for the stomach, which is either tan or white. The eyes are brown. Chinchilla – The standard color has a dark gray base with pearl gray and black. The name comes from the coloring of an actual Chinchilla animal whose fur is very lush. A Chinchilla rabbit also comes in a chocolate color. Chocolate – A deep, dark, brown with a light gray base. The eyes are brown with a reddish tint in low light. Fawn – This rabbit has a deep golden color on their back, chest and flanks. Their eye rings, inside of ears, under the chin, tails and stomachs are white. Their eyes are either gray or brown. Lilac – This is a medium gray color with a pinkish tint over the entire body. The eyes are the same color with a reddish tint color in low light. Lynx – An orange undercoat with a mixture of Lilac and a lighter orange color as a topcoat, covering the body and top of the rabbit’s tail. The tail, stomach, jaw, eye rings and the inside of the ears are white. The eye color is a bluish-gray. Opal – A dark gray undercoat, a light bluish color top with a fawn color band below it, and a white stomach and eye rings. Their ears have specs of blue on them. The eye color is gray. Siamese – This is a lighter brown body color with the ears, head, feet, stomach and tail in a dark brown. Similar to a Siamese cat marking. The eye color is brown. Squirrel – The hair-shaft of this color is a mixture of gray and white bands. This color is on the back and sides of the rabbit with a white stomach and top of their feet. The nape of the neck as well as the eye rings and chest are a lighter shade of the body color. The ears are edged in a dark blue. They have gray eyes. Steel – There are two different versions of this color, Gold Steel or Silver Steel. The base coat is a black, blue, chocolate, lilac, sable or smoke pearl. Then the coat has a gold or silver tipping which will differentiate between the Gold Steel and the Silver Steel. The eye color for both versions is gray or brown. Tan Pattern – Is a solid color on the majority of the rabbit’s coat except for a lighter color on the eye rings, nose, jaw, chest and stomach. Tortoiseshell – This is a burning orange color on their bodies and it is mixed with a grayish-blue coloring over the rabbit’s back end and haunches. They have a two-toned tail; the body color is on top and the grayish-blue underneath. Their eyes are brown. So now that you have the types of rabbits, coat patterns and colors, you can now look these over and pick a pet rabbit that is your favorite. 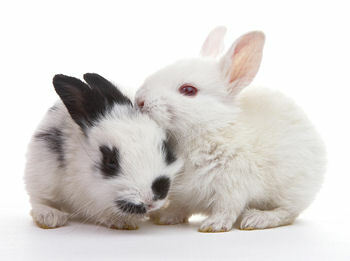 If looking for a pet rabbit, you can also talk to the different breeders in your area and have a look at their rabbits. They will have information on their breed. There are so many types of rabbits, sometimes it's hard to choose. I think all rabbits are cute and lovable. After studing these types of rabbits, I want one of each! Here's the info on the life span of rabbits.